The Split Storyboard dialog box lets you divide a storyboard into two parts. Each part can be saved as a different file. You can choose to save either the first half of the project, the last half of the project, or both. You can also choose to preserve the original project intact, or to remove the panels from the original project. The selected panel determines the point of division. For tasks related to this dialog box, see Project Management. In the Timeline, drag the red playhead to the panel where you want the split to take place. 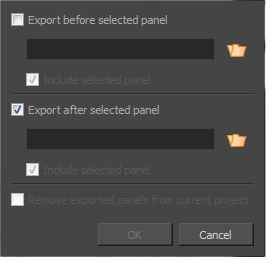 Exports all panels before the selected panel into a new file. Exports all panels after the selected panel into a new file. Includes the selected panel in the export. Removes the panels you selected to export from the current project. If you do not select this option, you will be left with an intact copy of your storyboard, along with one or both divisions as a new project file(s).